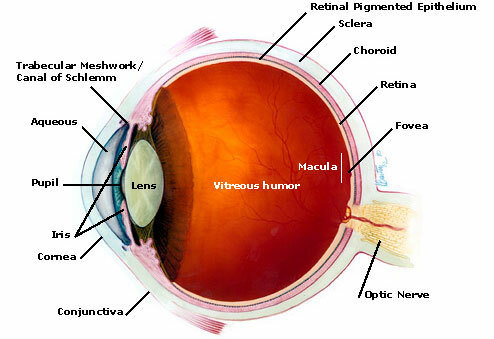 Symptoms of eye disease can vary a great deal depending on which structure is affected (see anatomy of the eye , thanks to www.eyecare-for-you.com for this image). For instance, if there is a superficial ulceration of the cornea from a contact lens that rubbed, there would be a lot of pain when blinking. The health care provider would see a whitish area where the ulceration is located on the cornea with proper magnification. 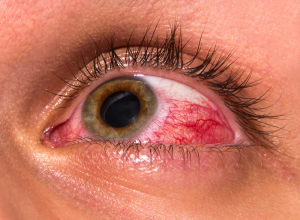 However in the case of uveitis (=also called “anterior uveitis” or iritis) there is a combination of sensitivity to light, redness of the eye, eye pain and headache. Other eye diseases have other symptom constellations. For instance with many major eye diseases there is a loss of vision: all of the retinal diseases like diabetic retinopathies, hypertensive retinopathy or retinal detachment are painless, but have in common either an acute or chronic visual loss. Bleeding (hemorrhage) is always an alarm sign. It can occur at different levels. On the surface of the eye (subconjunctival hemorrhage) it looks impressive, but is usually harmless. In the case of a vitreous hemorrhage (thanks to medlibes.com for this link) blood was leaking from brittle vessels as in this case of diabetic retinopathy into the vitreous body from behind. Retinal hemorrhages occur usually in patients with systemic blood vessel disease. Itching is a symptom that points to allergic problems such as in allergic conjunctivitis. Blind spots (scotomas) are often not noticed by the patient until they invade the central vision. However, early detection of blind spots in the periphery when visual field tests are done can detect glaucoma at an early stage and prompt treatment can prevent permanent visual loss. Refractive errors are common and can be corrected with eye glasses or contact lenses. If this cannot be done for both eyes, there could be underlying eye disease such as amblyopia or other conditions and an eye specialist should be involved in further testing. Floaters are a common occurrence and are of no significance in most people. However, when they suddenly occur in a shortsighted person or in an older person and interfere with normal vision, an eye specialist should do a careful examination including indirect ophthalmoscopy to rule out a retinal tear or a small area of retinal detachment. Here is a table with some of the more common eye diseases and their symptoms. 1. The Merck Manual: Double vision (thanks to www.merckmanuals.com for this link).